Shiny Walrein in game: 32 Who? Important notice! Pokemon Shiny Walrein is a fictional character of humans. 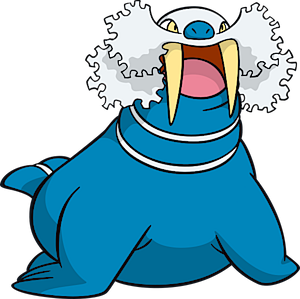 Walrein (Japanese: トドゼルガ Todoseruga) is a dual-type Ice/Water Pokémon introduced in Generation III. It evolves from Sealeo starting at level 44. It is the final form of Spheal. Walrein is a large, sea lion-like Pokémon with a layer of blubber under its skin. It is primarily blue, with thin, white rings around its neck and lines on its fan-like tailfin. There are two long, ivory tusks in its upper jaw. It has a round snout and yellow eyes, and large tufts of white fur about its face and neck. Its four short legs have long flippers instead of feet. 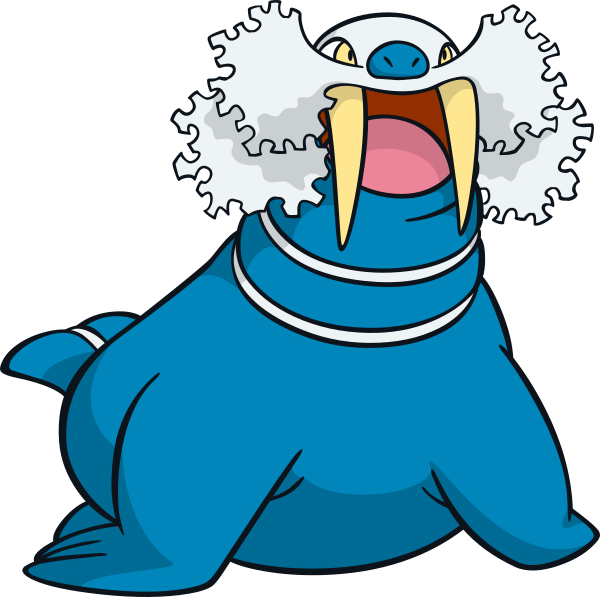 Walrein lives in and around icy seas, where it is insulated against the cold by its thick layer of blubber. This layer of fat also protects it from enemy attacks by causing them to bounce off. It can coat its body in ice and charge opponents to use its former signature move, Ice Ball. While its long tusks are capable of crushing ice, they may break during battle. This Pokémon can be found in herds, which are fiercely protected by the leader. Walrein made its debut under the ownership of Team Aqua in Fight for the Meteorite!. They also appeared later in The Scuffle of Legends. 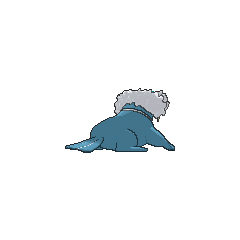 A Walrein appeared in Training Wrecks, under the ownership of Rocky. Walrein battled Ash's Pikachu and Grovyle, alongside a Quagsire. Before Grovyle could attack Quagsire with its Leaf Blade Walrein attacked Grovyle with its Ice Ball. Pikachu defeated Walrein in the end while Grovyle took care of Quagsire. Walrein was Katie's final Pokémon while battling Ash in A Judgment Brawl. The Ice Break Pokémon defeated Ash's Swellow, and Corphish (the latter was already tired out from battling Katie's Golduck), and was defeated by Ash's Grovyle. A Walrein appeared in A Hurdle for Squirtle under the ownership of a Pokémon Coordinator competing in the Saffron Contest. A large group of Spheal, Sealeo and Walrein are seen at the beginning of Destiny Deoxys. Multiple Walrein made brief cameo appearances in Giratina and the Sky Warrior. Walrein first appears in Walrein and Camerupt. It was used by Archie to battle against Maxie, and later when ironically fighting alongside the Magma Leader against Ruby and Sapphire, though they are able to exploit the two leader's weakness of taking little notice of each other's presence and easily win. A few more volumes later, in the climax of the Ruby & Sapphire chapter, Archie sends out several more Walrein alongside Maxie's multiple Houndoom to buy time for the two to escape, but are thwarted. Much later, under the guise of Guile Hideout, the same Team Aqua leader sends out a Walrein that is easily beaten by Poli alongside his Masquerain (beaten by Polibo). 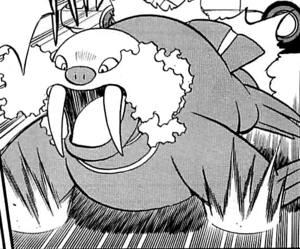 Pokémon Adventures PS230 The two well-developed fangs can break a 10-ton iceberg with one hit. It can survive well in temperatures well below zero degrees with its thick layer of fat. Pokémon Mystery Dungeon: Explorers of Time and Explorers of Darkness: A Walrein looks after the newborn Manaphy when it is discovered that it needs to live in the sea. Walrein's two massively developed tusks can totally shatter blocks of ice weighing ten tons with one blow. This Pokémon's thick coat of blubber insulates it from subzero temperatures. 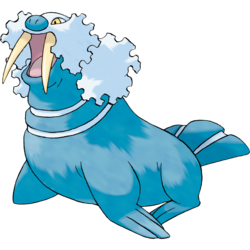 Walrein swims all over in frigid seawater while crushing icebergs with its grand, imposing tusks. Its thick layer of blubber makes enemy attacks bounce off harmlessly. To protect its herd, the leader battles anything that invades its territory, even at the cost of its life. Its tusks may snap off in battle. It swims through icy seas while shattering ice floes with its large tusks. It is protected by its thick blubber. It shatters drift ice with its strong tusks. Its thick layer of blubber repels enemy attacks. Not only does its thick blubber keep it warm, it also protects it from attacks. It shatters ice with its prized tusks. Walrein’s two massively developed tusks can totally shatter blocks of ice weighing 10 tons with one blow. This Pokémon’s thick coat of blubber insulates it from subzero temperatures. Moves marked with a superscript game abbreviation can only be bred onto Walrein in that game. 51%-100% HP I rode out on ice floes! 26%-50% HP Watch it! My HP's been cut in half! Level up There! I've gained my level! My tusks have turned more rigid! It attacks by spitting hunks of ice and letting loose blizzards. 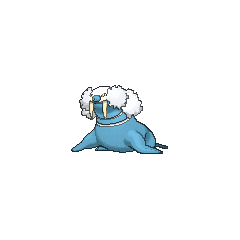 For other sprites and images, please see Walrein images on the Bulbagarden Archives. 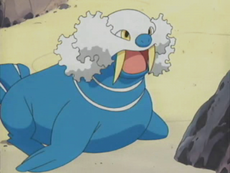 Walrein is based on a walrus. Walrein may be a combination of walrus and a corruption of rain or reign. Todoseruga may be a combination of 胡獱 todo (sea lion) and 海象 seiuchi (walrus). Mandarin Chinese 帝牙海獅 Dì Yǎ Hǎi Shī Literally "King(-sized)-tusked sea lion".